Editors note: File this one under "Classics." Used with permission. She was only six years old when she was diagnosed with a seizure disorder and placed on Dilantin (phenytoin). She did well for years with a normal physical and cognitive development. Many years after her initial seizure, it was elected to stop her Dilantin, since it was felt she might have outgrown her need for the medication. Unfortunately, not to long after while sitting in the passenger seat of the car, she suffered a cardiac arrest, and slumped forward. 911 was called and the paramedics found her to be in ventricular fibrillation. A single external cardioversion restored sinus rhythm. Gratefully, she recovered completely. She eventually went on to get a defibrillator after her cardiovascular workup demonstrated no structural cardiac disease. 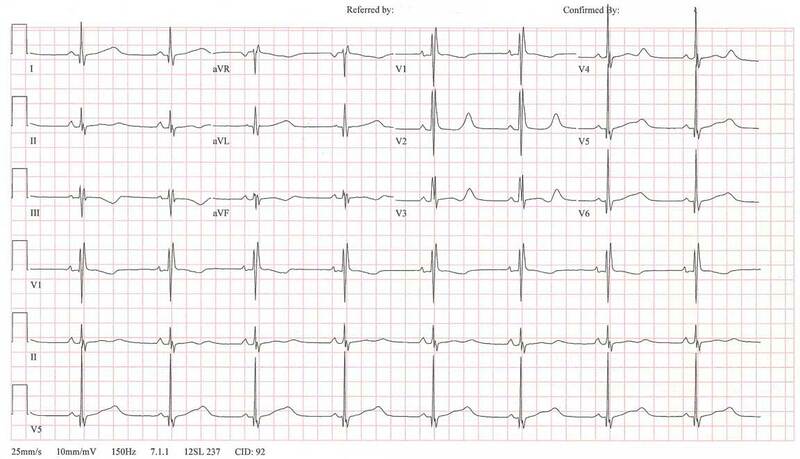 Her dilantin was continued and she did well, until a cardiologist tried to stop her dilantin; she received a flurry of ICD shocks when that occurred. The dilantin was restarted and she has not had any ICD shocks or non-sustained VT detected on her subsequent defibrillator interrogations. Oh, what does her EKG look like now, you ask? So while the general diagnosis might seem obvious to the skilled EKG reader (I'll let you figure out which specific type of disorder this represents), it is clear that her antiarrhythmic of choice for this patient is dilantin: it as been well-tolerated for years, highly effective, and safe for her for over twenty years. I wonder what will happen the our comparative effectiveness research czars note that the treatment for cardiac arrhythmias with this drug is not labeled as indicated for this disorder. Will her prescription no longer be covered? Long QT type 3? Wonder if she ever really had seizures. Just spent the last hour researching this one and my thoughts are consistent with Jason's. LQT-3 effectively treated by enhanced repolarization with a class 1B antiarrhythmic agent? Very curious too if she ever had true epilepsy or if the seizures were simply related to arrhythmia. Either way its good that she's doing well and not receiving shocks. Interesting case! Neat case of Long QT (even LQT3 is a phenotype, representative of several genotypes, isn't it?). In the "old days" diphenylhydantoin was a fairly widely utilized "antiarrhythmic". Standardized protocols work for the majority of patients. Most physicians don’t know as much in specialized fields as someone who has taken as long as a cardiologist or electrophysiologist does. In this case, documentation in the medical record as to why a protocol was not followed or deviated from, would almost certainly have justified use of diphenylhydantoin in this patient. That documentation would have taken much less time to write than it took to put together this fascinating case report. In the EMR it would have been present in perpetuity and could be referred to and used every time some physician or PA would need to justify use of this drug in this patient. Consider evaluating HDL levels on patients receiving diphenylhydantoin. They are remarkably high. For the record, this is a patient with genetically-proven Long QT-2, not LQTS-3, representing the second most common form of long QT syndrome. This form of long QT syndrome involves mutations of the human HERG gene (also known as KCNH2) on chromosome 7. The HERG gene is part of the rapid component of the potassium rectifying current (IKr). Drugs that prolong QT intervals often interact with this ion channel. While mexilentine might work in this patient since if tends to shorten the action potential, she is understandably reluctant to switch medications. Like lidocaine, dilatin, shortens QT intervals also and probably contributes to its effectiveness in this patient. Like you, I suspect her "seizures" were really bouts of polymorphic VT.
Dr. Daftary - thanks for the tip re: HDL, tho' I'm not sure how that would affect her management.